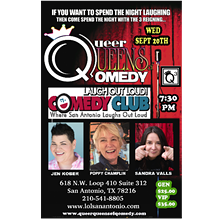 Chicago-based comic and Second City alum Poppy Champlin returns to the Alamo City with fellow “Queer Queens of Qomedy” Jen Kober and Sandra Valls in tow. 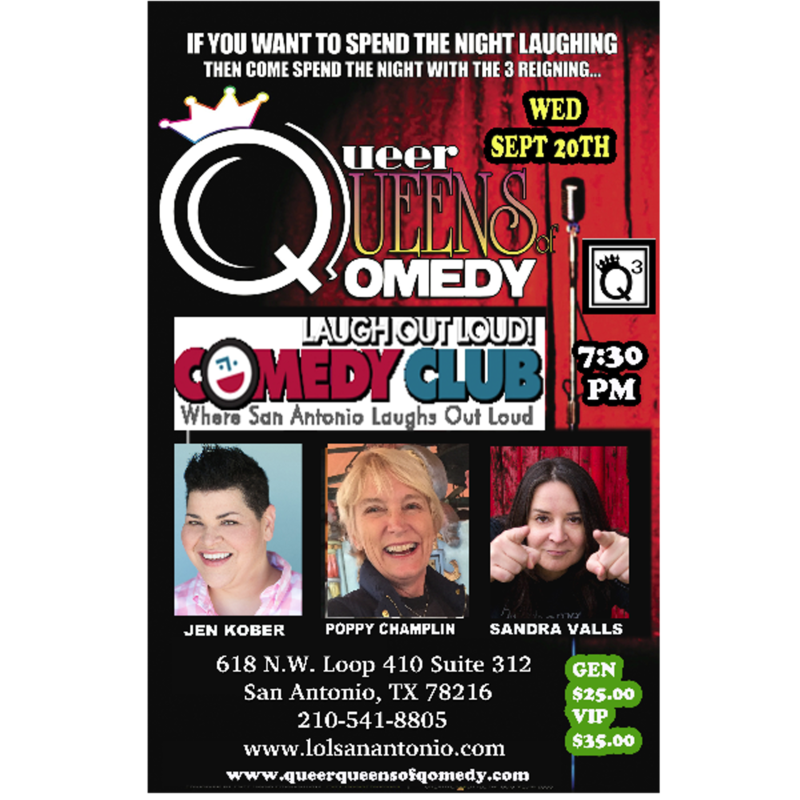 Headlining the Queer Queens tour is Kober, whose blend of stand-up and storytelling has brought crowds to their feet in clubs across the U.S. The Louisiana native has made appearances on NPR’s Snap Judgement, ABC’s The Middle and BET’s Real Husbands of Hollywood, among numerous other shows. Valls, a Laredo native who now lives in Los Angeles, has been featured in the Showtime specials The Latin Divas of Comedy, and Pride: The Gay and Lesbian Comedy Slam, was named “one of the top badass comics to watch for” by Curve Magazine, and entertained the crowd at last year’s HRC San Antonio Gala. Known for a “wild and roaming spontaneity” that makes each show feel one-of-a-kind, Champlin boasts a long and stellar career that includes spots on Logo, Showtime, HBO, VH-1 and Comedy Central, and notably earned the title of “America’s Funniest Real Woman” on late comedy icon Joan Rivers’ show back in 1993.